Right off the back of the busiest summer in Remerge’s history, dmexco came around hot and fast with record breaking attendance, and weather - it got up to 32 degrees at one point! Dmexco holds a special place in all of our hearts here at Remerge, as it’s actually where we launched the brand two years ago. Being back this year with new product features, and an even bigger team was an amazing experience for all of us and so we wanted to share some highlights and the main industry trend that we spotted throughout the conference and expo. In a ‘showdown’ at The Congress Hall of the ever-expanding conference, a panel of experts from companies like Google, MediaCom and Teads sat down to tackle the issue of ad blocking. The discussion began with a shocking figure: €35 billion in revenue is expected to be lost by 2020 due to ad-blocking, and that’s entirely accurate according to Global Chief Digital Officer of MediaCom, Deirdre McGlashan. While Sourcepoint CEO Ben Barokas offered his own company’s ‘content compensation’ solution as a potential answer to the ad-blocking issue, Teads’ CEO Pierre Chappaz maintained that ad blocking was the opening up of a ‘conversation’ with a modern consumer who is begging for better ad experiences, and an opportunity for marketers to provide more accurate, relevant content for communication. 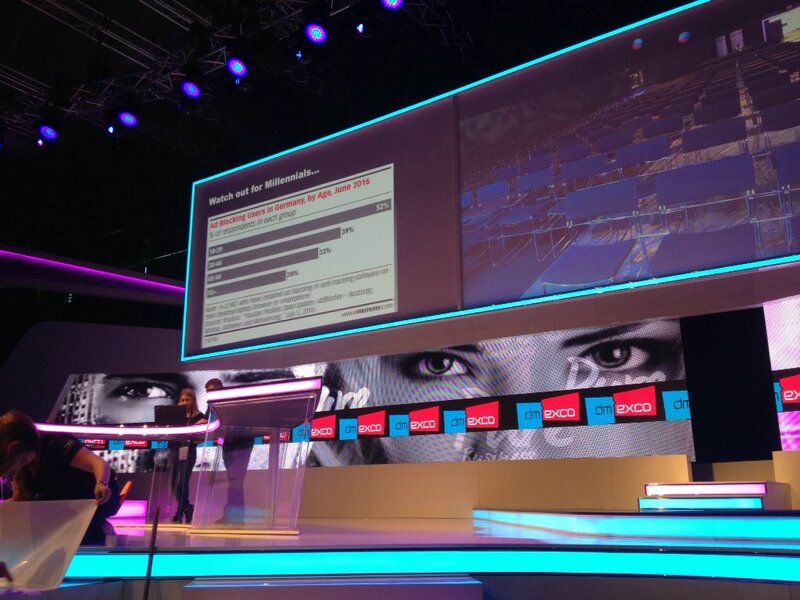 The talk took place against the backdrop of a potentially huge announcement which will unify Google, Facebook, P&G, Unilever, the World Federation of Advertisers, Groupm, and the Interactive Advertising Bureau in a coalition to tackle ad-blocking, aptly named BetterAds.org. Stephan Loerke of The World Federation of Advertisers emphasised the urgency in creating industry standards for companies to refer to in order to provide better advertising experiences for consumers. 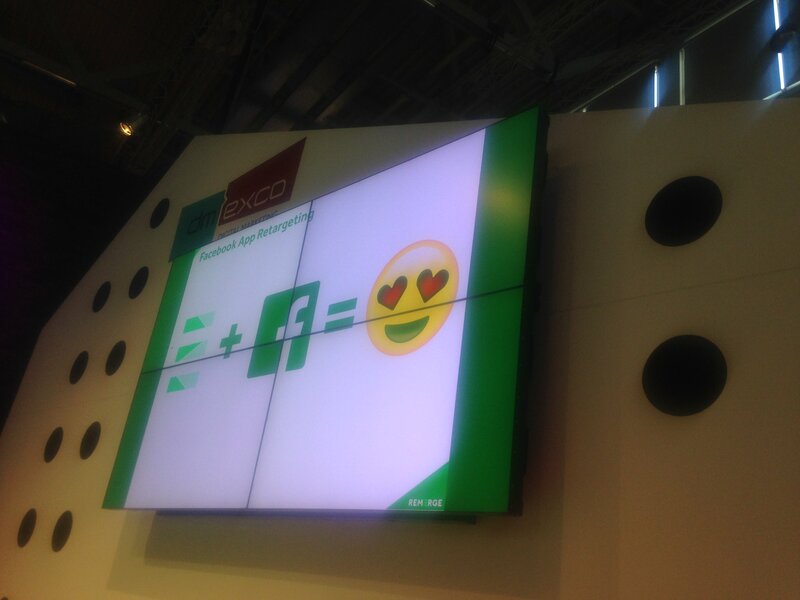 We had our own announcement to make at the Start-up Village where our CEO Pan Katsukis took to the stage to reveal that we will be integrating our programmatic performance engine with Facebook. The integration offers even more scale for our clients while ensuring no budget waste or spamming of users, by automatically excluding customers from retargeting display ads the moment they convert. The launch addresses the annoyance described by Deirdre McGlashan who explained how she was sick of being targeted with the same outdated, irrelevant product ads - a sentiment echoed by most shoppers which ultimately leads to ad blocking. The ‘people focused marketing’ trend was seen everywhere from the Start-up village, to the experience hall where the newest innovations in video advertising were on display. Video advertising has seen a massive spike in popularity since last year with statistics showing that video ads have the highest click-through rates of all ad formats. Marketers were keen to explore new ways of communicating with customers in an unobtrusive way that actually adds to the user experience, and creates a better connection between brand and customer. In a talk on the power of data in storytelling, a panel of c-suite executives representing companies like Spotify, Hootsuite, and Getty Images described the challenges in establishing that coveted connection, and the best practices for data usage in advertising and marketing strategies. For the majority of the panellists, data held the answer to creating relevant, personalized content that customers would want to see and hear, but all seemed to agree that the data was only the first step in understanding a customer, and that the real challenge lies in understanding their usage habits, how they consume the content, and what they are looking for in their advertising and brand messaging experiences. 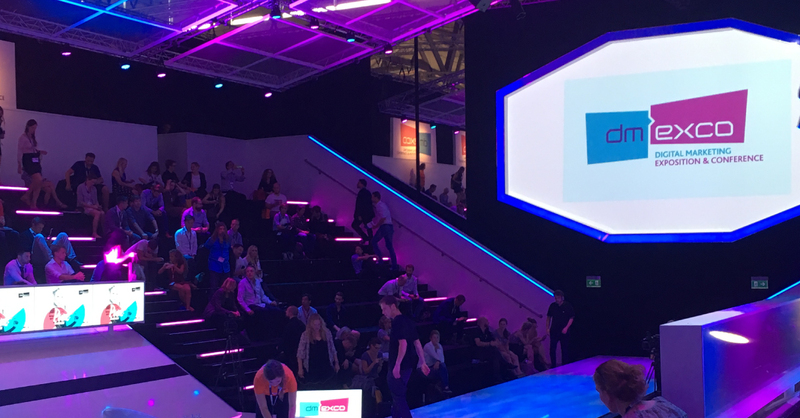 Virtual Reality and Augmented Reality were once again a major fixture at dmexco with marketers scrambling to find ways to implement the technology in their strategies since the raging success of PokemonGo. However, the focus has switched somewhat since last year from the abstract potential of VR and AR technology to the practical uses for advertisers and marketers.The New York Times Associate Digital Editor Sam Dolnick explained his company’s VR strategy for visual storytelling and plans for regular, accessible VR content. Dolnick also revealed his intention to explore more dated methods of communication such as SMS, which was trialled during the Olympic games in Rio when over 20,000 subscribers signed up to receive message updates directly into their inbox from a New York Times journalist. This exploration into new and old methods of communication for brand awareness, and a deeper connection between customer and brand created a real buzz around the conference and expo hall, and seemed to explain this year’s motto - “Digital is everything not every thing is digital.” Despite the discourse of fraud and the negative impact of Brexit hanging in the air, the proactive and explorative approach of companies in retaining and engaging with their customers was truly inspiring and has got us amped up for what looks to be an exciting year ahead. To all who we met with in the expo halls, the debate hall queues, at our stand, or at our PREmexco party, thank you for making it such an amazing experience. We look forward to seeing you next year where we hope to announce even more product innovations to tackle the challenges of mobile marketing.